A challenge to me, is it a challenge to you too ? 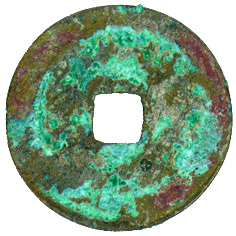 I have posted here with 4 Cheng Lung Yuan Pao copper cash images. The legends of all 4 coins are read in a clockwise direction. I want to point out that the legend of the first cash [No.191] is completely written in early clerical script (Li Shu). 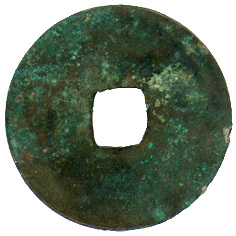 It is very uncommon in Chinese numismatics. Please pay more attention at the 3rd Chinese character 元 "YUAN", especially the last stroke appeared without a hook. Its structure is still basically seal script in style. 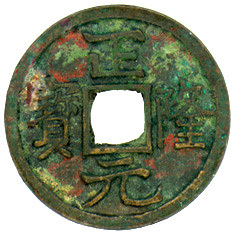 You hardly see a "YUAN" appeared in early clerical script [西漢隸書 Li Shu of Western Han Dynasty] in Chinese coinage. 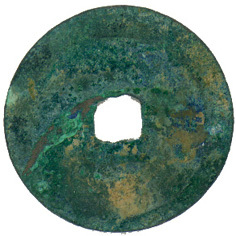 So that I think the 1st copper cash isn't a Chinese cash, though it looks like a Liao or Southern Tang cash. The legend of this cash is completely written in early Li Shu (scribe style) The structure of the characters are generally more compressed but broad in width, their structures are still basically seal script in style. You cannot see the last brush movement at the end of the horizontal strokes of the Chinese character. Though the later clerical script appeared with 蠶頭雁尾 "silk-warm's head and swallow's tail". [Every character is to be written as the beginning of the horizontal stroke being lowered while the end being raised. This type of characteristics actually is 東漢隸書 Li Shu of Easten Han Dynasty in Chinese calligraphy.]. The inscriptions of this cash are typically full and strong, evoking a feeling of dignity and power. When compare its diameter and weight with other standard Chinese cash, I think this cash is an official issue. But I don't think this is a Chinese cash, as I have never seen an ancient Chinese cash bore completely with early clerical script in the legends. This may be a Annamese cash. If it was officially issued, its background history would be a very interesting story. This need a further research by all of us. This Cheng Leng Yuan Pao cash was cast in the 2nd year of the Cheng Lung reign (Zheng Long) (1156-1161AD) of Emperor Hai Ling Wang 海陵王 (Wanyen Liang or Wanyan Liang 完顏亮) of 金 Chin Dynasty (Jin). Chin was a Tartar state, established in 1115 and was conquered by the Mongols in 1234. Chin normally used Sung cash, but they occasional cast their own cash modelling on Sung cash and inscribed with Han characters. The legend of this cash is written in K'ai Shu. ( Orthodox Chinese characters). 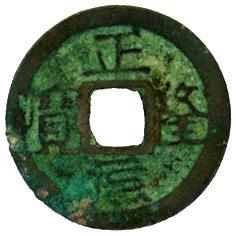 This Cheng Lung Yuan Pao cash was cast in the Cheng-Lung Pao-Ying reign (1163-1173AD) of Ying Tsung Emperor of the Li Dynasty of Annam. In 1137, The Shen Tsung Emperor of Li Dynasty passed away. His son, Li Tien-tsu 李天祚 was chosen to succeed the throne with the reign title Shao Ming 紹明 (Temple title, Ying Tsung). After 3 years, Ying Tsung Emperor changed his reign title as Ta Ting 大定, he minted Ta Ting T'ung Pao cash (Ta Ting period 1140-1162AD). 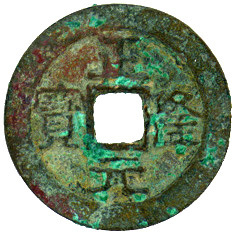 In 1163, Ying Tsung changed his reign title again as Cheng-lung Pao-ying 政隆寶應, he minted Cheng Lung Yuan Pao during his new reign period. At last, he changed his reign title as Tien-kan Chih-pao 天感至寶 in 1174, he did not cast new cash and passed away one year later. I think Ying Tsung's cash were issued in small quantities only, as his coins are quite rare. It is very strange that the Annamese emperor cast their cash with the same name as the Chin Dynasty of China. I wonder is there any relation between them. 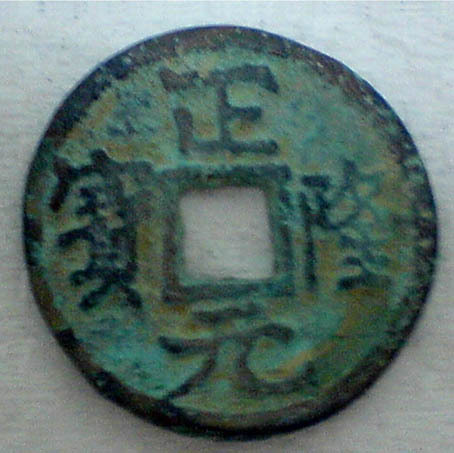 The Annamese Ta Ting T'ung Pao and Cheng Lung Yuan Pao are different from the cash of Chin Dynasty by their wider rim on the obverse. This Cheng Lung Yuan Pao is a typical Annamese private issue or imitation with its small size and lightness in weight. This coin is believed to be cast during the early 18th century or later period. 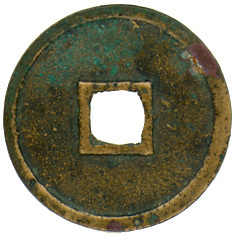 The regend of this cash is written in both K'ai Shu (regular style) and Chuan Shu (seal style). The first and second characters are written in K'ai Shu, while the third and fourth characters are written in Chuan Shu. The regend denoted like this cash is known as 雜書 "Tsa Shu" by the Chinese collectors. "Tsa" means mixture and "Shu" means write in Chinese. 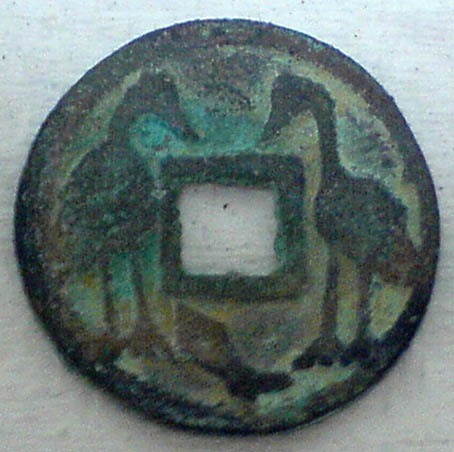 Recently I have learnt a new name for this type of coin as floater coins. For a deeper discussion of the floater coins, I think I need to find out more informations. If you want to share your knowledge and enthusism in this hobby, feel free to drop me a line. Thank you in advance. I received an email with pictures of a Cheng Lung Yuan Pao cash coin from Mr. Chuwy on 25th November 2008. This Cheng Lung Yuan Pao cash is written in K'ai Shu ( Orthodox Chinese characters). But it was cast with the irregular rims on the both sides. As I view the reverse side, I find that there are two egrets and a fish on it. I believe this is a recent made charm [ Coins use as amulet against evil and not as money. Hua Chien is another name for charm to the Chinese collectors ]. The egrets were the auspicious birds in ancient China. Egret pronounces as "Lo" in Chinese. The pronunciation of " Lo 鷺" is similar to that of the word " To 多" [means abundant] in ancient China". Fish "Yu 魚" sounds the same as the word "Yu 餘" means spare] in China. So the pattern means "Have enough and to spare". I believe this cash coin is a typical Chinese charm, though it is a recent product.